Discover phenomenal facilities and leading-edge technology. Science is about the thrill of new discoveries and experiences. God’s plan for you is waiting to be revealed, with excitement and fun in the discovery. It’s all here for the living at Indiana Wesleyan University: New friends. New insights. New environment. New opportunities. Founded in 1920, IWU is an evangelical Christian comprehensive university committed to liberal arts and professional education. Through innovative degree programs and student services, IWU has become one of the most prominent Christian universities in America. During the past 15 years, enrollment has more than doubled, making IWU the largest institution in the Council for Christian Colleges and Universities (CCCU). More than $200 million in new facilities has been added to the campus since 1990. Along with 11 residence facilities and townhouses, seven major buildings have been constructed, including an award-winning performing arts center; a multipurpose wellness and recreation center; a modern student center, which includes a movie theater; a well-resourced library; an academic building that houses facilities for radio and TV broadcasting; and a $22 million Chapel Auditorium. IWU’s striking facilities blend beautiful, modern architectural design with student-focused functionality. The most recent addition to the IWU campus is Ott Hall of Sciences and Nursing, which opened in the spring of 2014. The 111,250-sq. ft. health sciences building provides students expanded state-of-the-art teaching laboratories, research laboratories, and student interaction areas. With the new building has come a new doctoral program in Occupational Therapy and two master’s degree programs in Athletic Training and Public Health. IWU’s Biology department can perform a variety of molecular biology techniques while also offering the animal dissections that help in the learning of physiology. For Chemistry students, GC-mass spectrometry, high-pressure liquid chromatography, FTIR, atomic absorption, UV-vis, fluorescence spectrometry, and nuclear magnetic resonance spectrometry equipment can be found in the instrumentation facility. Finally, in the Physics department, a wide array of optical and electronic equipment is available. Classrooms are well equipped with the latest technology for optimal learning. 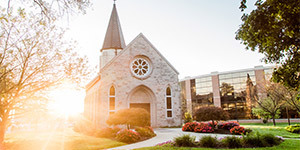 In fact, Indiana Wesleyan University has been recognized by the New Media Consortium as a world leader in innovative approaches to the use of technology. IWU is the first institution in the CCCU to be selected and joins an elite group of universities such as MIT, Princeton, and Yale in receiving this honor. IWU professors are student focused and possess strong academic credentials. All of the science faculty are doctorally prepared and come from major research institutions such as the University of Michigan, Indiana University, and Purdue University. Most have been published in scientific literature and have ongoing undergraduate research projects. For most college students, an education in the sciences revolves around memorizing long lists of factual information and “cook-booking” through age-old laboratory exercises. While some factual learning and recall are critical to grasping fundamental natural science concepts, IWU faculty believe original undergraduate research is also essential. For this reason, two credit hours of research are required for all Chemistry and strongly recommended for Biology majors. Many students enjoy the process of research over the summer. 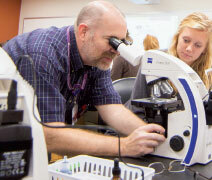 IWU natural sciences alumni have excelled at graduate and professional schools of every kind. Nursing is an art that blends scientific reasoning, technological skills, and a compassionate heart. Nurses are the professionals responsible for coordinating patient care. Compassionate care is a key element in the nursing educational formula at IWU. We believe people are created in the image of God. All patients, despite age or condition, have intrinsic value. Students learn to provide competent holistic care for individuals, meeting their physical, psychological, social, and spiritual needs. Nursing practice is founded upon sound scientific principles. A strong background in the natural sciences is essential for a successful nursing career. IWU freshman Nursing students take 16 credits of anatomy, physiology, chemistry, and microbiology. These scientific principles are applied in nursing courses throughout the sophomore, junior, and senior years. Nurses in the 21st century are characterized by their mastery of technology. Paperless charts, monitors, and computerized instruments in every practice setting provide the accurate data nurses need to make critical decisions about safe and effective care. IWU labs are fully equipped with the latest technological advances, so students are properly prepared before they enter a clinical setting. Indiana Wesleyan University does not cap enrollment into the Nursing program and has had an NCLEX pass rate above the national average for the past 10 years. With that kind of performance, it’s no surprise that IWU nurses are in demand. And with employment opportunities growing faster in nursing than in any other occupation, IWU graduates have a variety of professional options. Hospitals are just one of many settings where nurses practice. Other sites include schools, industries, rehabilitation units, the military, home health, hospice, wellness centers, insurance companies, clinics, mission fields, public health departments, and travel agencies. Nurses collaborate with physicians and technicians as members of interdisciplinary teams working to save lives in emergency rooms and coronary care units. They design and manage patient care in various settings involving many specialties. Nurses with graduate education and advanced experience may become administrators, nurse practitioners, clinical specialists, educators, and researchers. Nurse attorneys defend clients in malpractice suits. Nurse policy analysts advise legislators on health issues. Nurse epidemiologists help control outbreaks of infectious diseases. Come visit our campus and catch a glimpse of student life at IWU. Go to a microbiology, pharmacology, or pediatrics class. Meet our faculty. Walk across IWU’s beautiful contemporary campus. You won’t want to miss this! 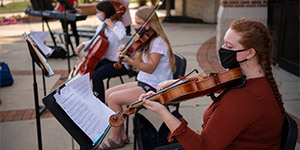 You can also learn more and apply online at indwes.edu/admissions.